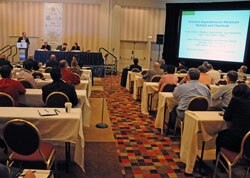 It looks like we have nearly 300 people attending the 2010 Corn Utilization and Technology Conference. I sat down with NCGA President and South Dakota corn farmer, Darrin Ihnen, this morning and we talked about the need for this kind of conference. Darrin says CUTC brings out ideas that are still in the development stage while helping the industry come up with new uses of corn. He says that as we grow more corn there is a continuing need to develop new products and markets. He is excited about things like ethanol and ethanol by-products since he’s from a state that doesn’t have a livestock industry to take advantage of these products that are being made from his crop. He says there are a lot of the participants at CUTC who represent companies that already have corn products but may be looking for new and cost effective ways to help their bottom line. You can listen to my interview with Darrin below.